Check out the Naples Art Association Calendar for upcoming events in the area. No matter what your passion may be, Naples has it all and is sure to please the widest variety of tastes. Click the links below for more information on how you may discover the arts in Collier County! If you like fast, exotic, collectible, or antique automobiles, then Collier has everything you need in order to get you motor running! The Revs Institute is a physical and virtual museum with over a 100 of the most profound and rare automobiles ever collected in one location anywhere! The Naples Chapter of the Ferrari Club of America hosts "Cars on 5th" each winter, which is one event that should not be missed! The 2016 show broke all prior year records with over 575 entries of superb exotic and collector car, which over 50,000 people that attended! The annual show has over 125 Ferraris, 60 plus Corvettes, and host of Jaguars, Lotuses, Triumphs, Porches, and rare race cars. Click here to see the gallery from the 2016 show. 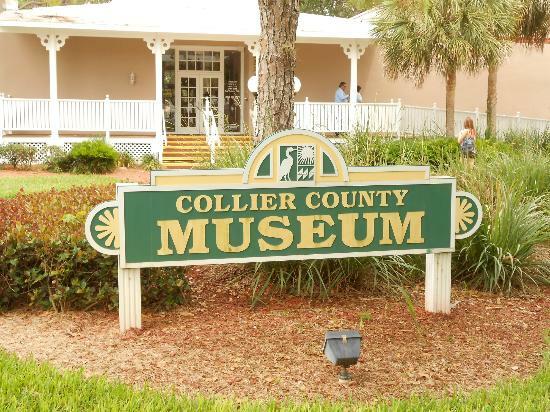 Collier County Museums is a collection of five separate County owned museums in Naples, Immokalee, Marco Island, Everglades City, and Naples Depot. Each facility provides a different experience and glimpse into Collier's past and present. 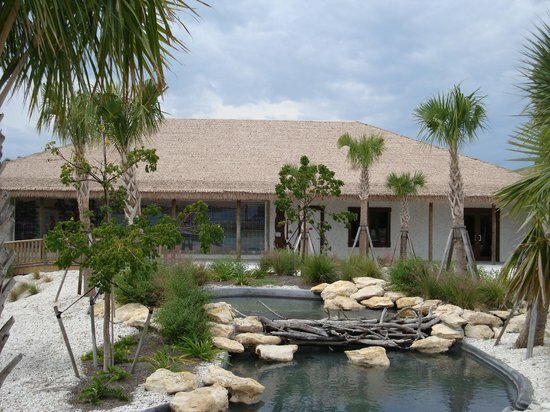 Collier County Museum - Nestled on five acres of native Florida landscaping, our flagship museum at the County Government center in Naples offers newly created exhibits and galleries that capture the full panorama of local history. Pack a picnic and linger a while in the museum's shady backyard. Then do a little exploring on your own in our native gardens, restored Naples cottages, the archaeology lab, Seminole village or Calusa Indian camp (Collier County Museum). Immokalee Pioneer Museum at Roberts Ranch - Exhibits, living history programs, and twenty carefully preserved original buildings and features tell the story of the cow hunters, ranchers and pioneer-spirited families who struggled to tame this vast wilderness prairie on the edge of the Big Cypress Swamp. The Immokalee Pioneer Museum at Roberts Ranch is listed on the National Register of Historic Places and is located in downtown Immokalee, a scenic 44-mile drive east of Naples (Collier County Museum). Marco Island Historical Museum - Temporary and traveling exhibits trace the settlement of this subtropical island paradise from its early pioneer roots as a fishing village, pineapple plantation and clam cannery, through its explosive growth and development in the 1960s by the Miami-based Deltona Corporation (Collier County Museum). 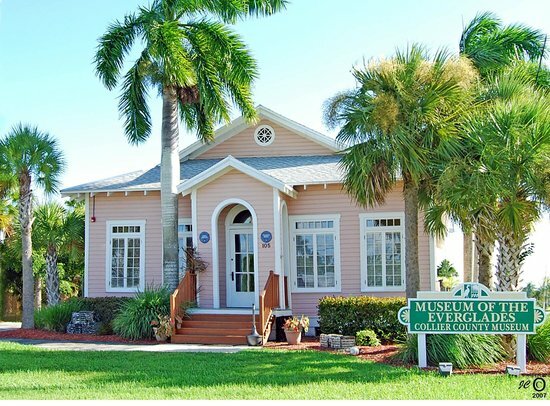 Museum of the Everglades - First opened in 1927 as a commercial laundry, today's Museum of the Everglades dates back to a time when construction of the famous Tamiami Trail was well underway and the tiny settlement of Everglades served as the first County seat. The museum's permanent and rotating exhibits provide visitors with an in-depth look at over 2,000 years of human history in the area and tell the story of those adventurous enough - and stubborn enough - to settle Southwest Florida's lush "River of Grass." Faithfully restored to its original, 1920s Collier-era appearance, the museum is listed on the National Register of Historic Places and is located 35 miles east of downtown Naples (Collier County Museum). Naples Depot Museum - Seminole dugout canoes, a mule wagon, antique swamp buggy, restored rail cars and exciting interactive exhibits tell the story of how trade and travel transformed Naples from a napping village of 300 souls into today's glittering Gulf coast resort (Collier County Museum). Also located on this site is Naples Train Museum, a privately owned and operated museum that features an interactive model and train ride for children.